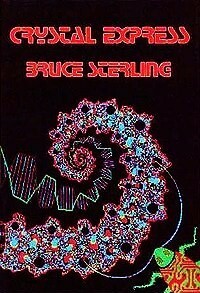 Crystal Express, Bruce Sterling, Arkham House Publishers, 1989, ISBN 9780870541582, 264pp. This book would be worth the price alone for gathering together the Shaper/Mechanist stories, the fiction that, along with William Gibson’s Sprawl stories and John Shirley’s “Freezone,” codified a movement. These stories were the cattle-prod to SF in the 80s, and, while they weren’t the only good work being done, sparked more interesting fiction and discussion than anything else. Cyberpunk has waned, and will continue to in spite of the imitation work that it spawned which is now hitting the stands, all while the original purveyors continue to move in unique directions. But the work itself, the techno-gritty, seedy stories, stand apart from the arguments and bickering; they are as effective today as when they appeared. But the Shaper/Mechanist stories make up only a third of Crystal Express. There’s also the science fiction stories such as “Green Days in Brunei” and “The Beautiful and the Sublime” that showed Sterling understood a great deal about character and humor in addition to technological impact. And there’s the fantasy stories, like “The Little Magic Shop” and “Dinner in Audoghast,” historical and whimsical, more treats from Sterling’s mixed bag of tricks. The hardback from Arkham is, like their other publications, a beauty in itself and nicely compliments the stories that it presents, and contains some interesting graphics from Rick Leider. And fortunately for those of you who don’t buy or can’t afford hardbacks, a paperback is upcoming for publication before the end of the year.